Sign into Goodreads to see if any of your friends have read Charlotte's Web. Have you seen the annotated version that shares White's editing process and correspondence with Ursula Nordstrom, his editor? I highly recommend it for writers. Mike wrote: "Have you seen the annotated version that shares White's editing process and correspondence with Ursula Nordstrom, his editor? I highly recommend it for writers." I haven't yet. I'll have to check it out! Curmudgeon wrote: "You old softie." I can't believe I still haven't read this. I have seen the animated film though. It had quite a few stars doing the voices. I don't think I cried though. Richard wrote: "I can't believe I still haven't read this. I have seen the animated film though. It had quite a few stars doing the voices. I don't think I cried though." Jason wrote: "Richard wrote: "I can't believe I still haven't read this. I have seen the animated film though. It had quite a few stars doing the voices. I don't think I cried though." Hmmmm, I've never read this one. I guess I will need to remedy that. My favorite book as a kid. I can't even tell you how many times I've read this book. Hands down my daughter's fave. Though I saw the animated film when I was a kid - Paul Lynde was born to play Templeton - I didn't get around to reading this til I was almost 50. Melki wrote: "...Paul Lynde was born to play Templeton..."
Jason wrote: "Melki wrote: "...Paul Lynde was born to play Templeton..."
Jason wrote: "Nice find, Richard!" I was a big fan of Bewitched back in the day! Jason I have a huge amount of respect for you and love your review! Nicole wrote: "Jason I have a huge amount of respect for you and love your review!" Awww, thanks Nicole! That's an incredibly kind thing to say. Tabitha the Pabkins wrote: "I cry every time!" I don't remember what it was, but the other day I thought about C'sW and immediately felt myself welling up within. I stopped and began thinking about football and all was well! Jason wrote: "Tabitha the Pabkins wrote: "I cry every time!" I don't remember what it was, but the other day I thought about C'sW and immediately felt myself welling up within. I stopped and began thinking abou..."
Cody wrote: "According to A.R., this book is for Middle Grades." But to follow up on your point Cody, yes, you are correct. 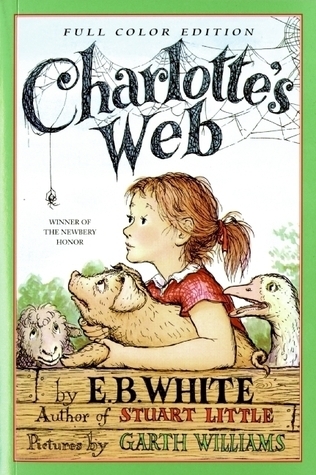 Charlotte's Web could be called a Middle Grade book. I've seen it listed as acceptable for ages anywhere from 6 to 12. I used the shortcut phrase "children's book" in my review because I'm an old man and these reading level classifications didn't exist way back when I was a kid, so I don't really know them without having to look them up. Thank you for your input on that! Cody wrote: "Jason wrote: "But to follow up on your point Cody, yes, you are correct. Charlotte's Web could be called a Middle Grade book. I've seen it listed as acceptable for ages anywhere from 6 to 12. I use..."
Well, as they say, ya learn something new every day! Thanks man! Steph wrote: "Me too, I'd never thought I'd grow fond of big, talking spiders...... And talented pigs :)"
THAT BOOK IS ONE OF MY FAVES!!! How does it work ? I cant read. I think you have me convinced to buy as close to a class set as I can find for next year. Pray I come across inexpensive copies. Kristina wrote: "I think you have me convinced to buy as close to a class set as I can find for next year. Pray I come across inexpensive copies." Monteya wrote: "Everyone shut up"
Why are you telling everyone to shut up? Explain yourself. Dario Trombas wrote: "Charlotte's Web is actually not that bad of a book. Yes I'm a kid. If you love spiders or technically any of the animals that you see in a barn then you will like this book. One of the reaso..."
Thanks for sharing your thoughts, Dario! charlotte is a different spider than others. Wilbur is all different with the words charlotte brainstorms then writes on her web. Loved your review. My favorite childhood book. I just finished reading it to my girls and I always tear up at the end. My baby is named Charlotte and that is no coincidence. Sandy wrote: "Loved your review. My favorite childhood book. I just finished reading it to my girls and I always tear up at the end. My baby is named Charlotte and that is no coincidence." That is a lovely tribute, Sandy!